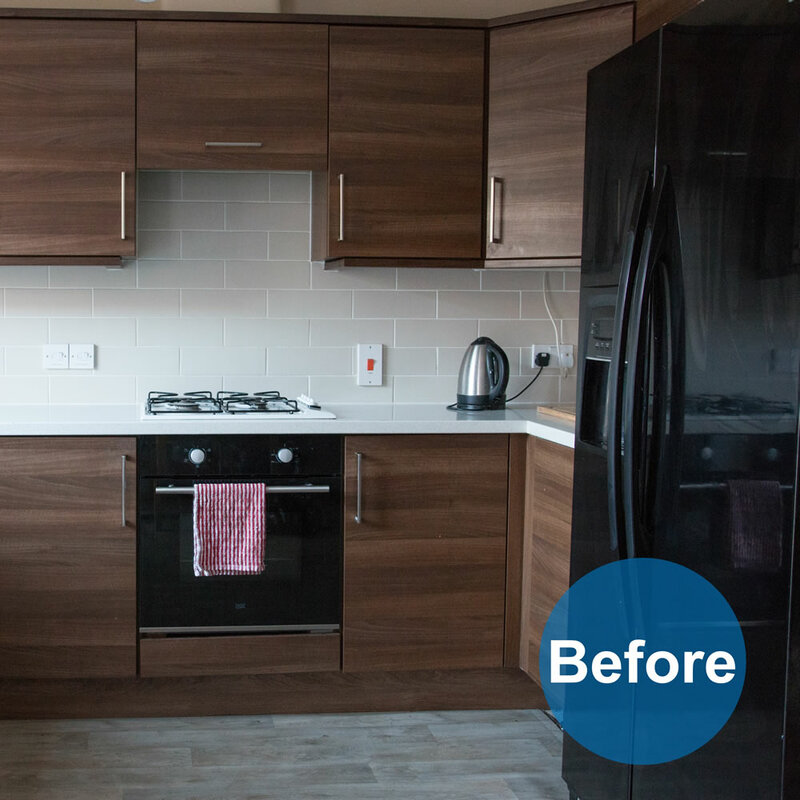 How to Give Your Kitchen a Makeover for Less Than £100! With the average kitchen costing around £3,000, what do you do when you don’t have the cash to splash out on a new kitchen (or you’d rather go on a nice family holiday instead)? And when there’s actually nothing wrong with your kitchen cupboards and worktops but you’re bored of their outdated design, how can you justify spending loads of money? Well, you can give them a quick and easy makeover that costs a fraction of the price of a new kitchen – and doesn’t involve all the mess of paint. Using d-c-fix self-adhesive film (aka sticky back plastic). Available in a variety of colours and designs, it’s easy to inject instant style into your kitchen, whether you want to give it a complete overhaul or you just want to add some standout features. Step one: Remove your kitchen doors and their handles. Step two: Clean thoroughly to eliminate any grease and dust. Step three: Measure the door and cut the film, leaving enough excess at each edge to fold around the door. (There is a handy grid on the backing paper which makes measuring and cutting in straight lines easier). Step four: Peel away a small section of the backing paper and secure a section of the sticky back plastic on the kitchen door. From there, gradually peel away the rest of the backing paper little by little, smoothing the film in place as you go. If your cupboard doors aren’t flat (e.g. shaker style), use a hairdryer on a low setting to warm the film so it moulds into the shape of the cupboard door, then push your smoother into the nooks and crannies. Step six: Hang the doors back in place, reattach the handles, stand back, make yourself a brew and admire your handy work! Style tip: The d-c-fix film used throughout this demonstration is ‘Pearlwood’. One roll (67.5cm x 2m) is enough to cover two 60cm cupboard doors. And with each roll costing £5 this means the average kitchen can be transformed for just £50! 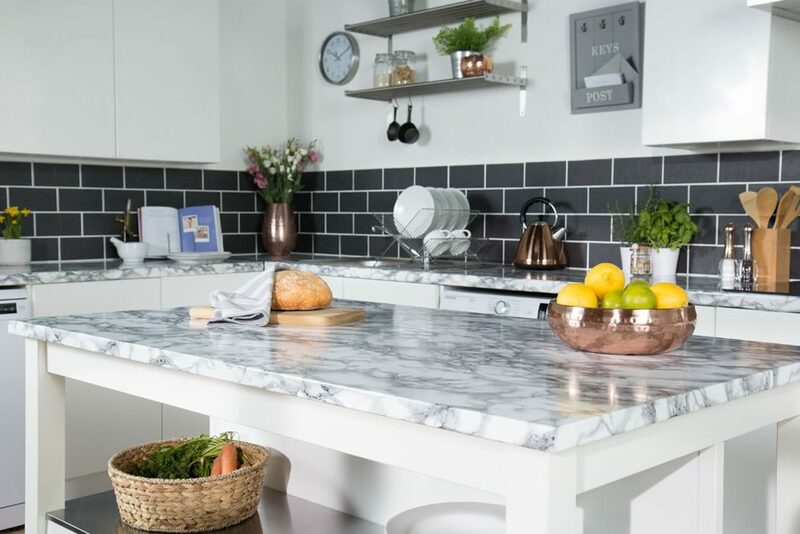 One of the biggest trends in kitchen worktops at the moment is marble or metallic designs. And while the real deal can be incredibly expensive, (yep – you’ve guessed it) there are sticky back plastic alternatives available. To carry out this revamp you’ll need all of the aforementioned equipment plus some silicone sealant. Step one: Thoroughly clean your existing worktop to remove any dust and grease. Step two: Measure and cut the film to size, leaving enough excess to wrap around the front edge of the worktop. Step three: Starting at one end of the worktop, peel back a small section of the backing paper and smooth into place with your smoother. Gradually peel away the remaining backing paper, smoothing from side to side as you go. Step four: Use your scalpel blade to cut around the sink and hob areas. You may find it easier to cut sections to size so you can piece these around tricky areas, but try not to have too many joins. A hairdryer will help soften the film and make it easier to mould around corners and curved edges. Step five: Use a silicone sealant around the hob and sink to prevent moisture getting under the film and lifting it away. Style tip: The d-c-fix film used throughout this demonstration is ‘Marmi Deco‘. Four rolls (each measuring 67.5cm x 2m) are enough to cover 8m of worktop. With each roll costing £5 this means the average kitchen worktop can be transformed for just £20! 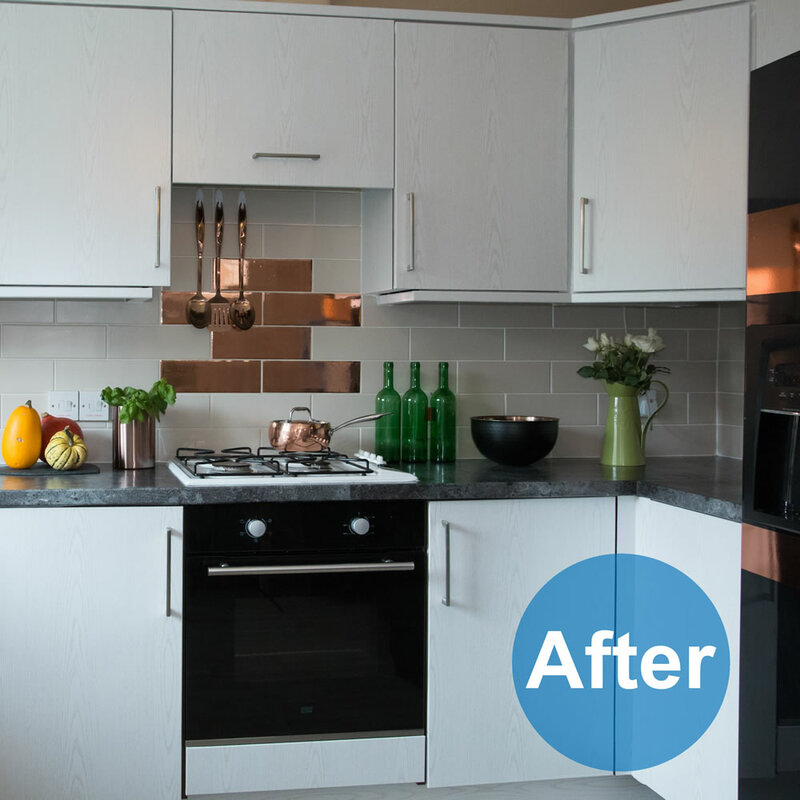 You could create an entirely new splashback in your kitchen with sticky back plastic. 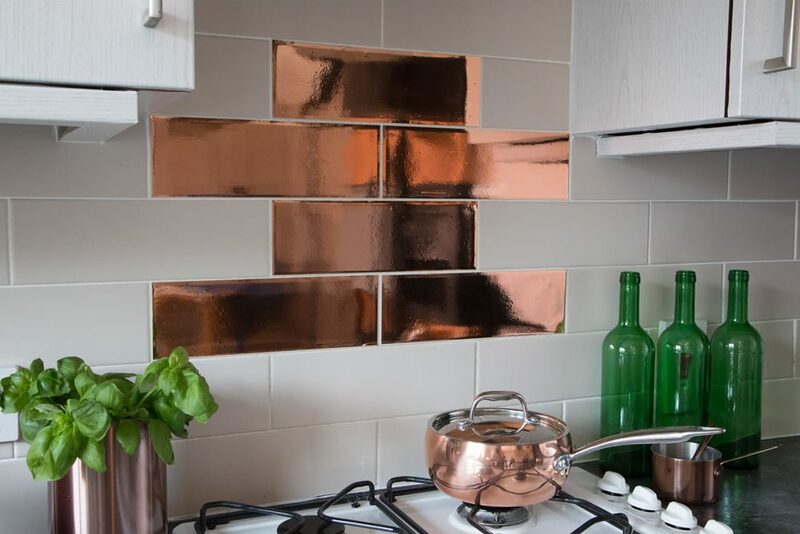 Or, cover a few tiles above your cooker to create a gorgeous feature. We love the below idea which uses the d-c-fix Rose Gold film. 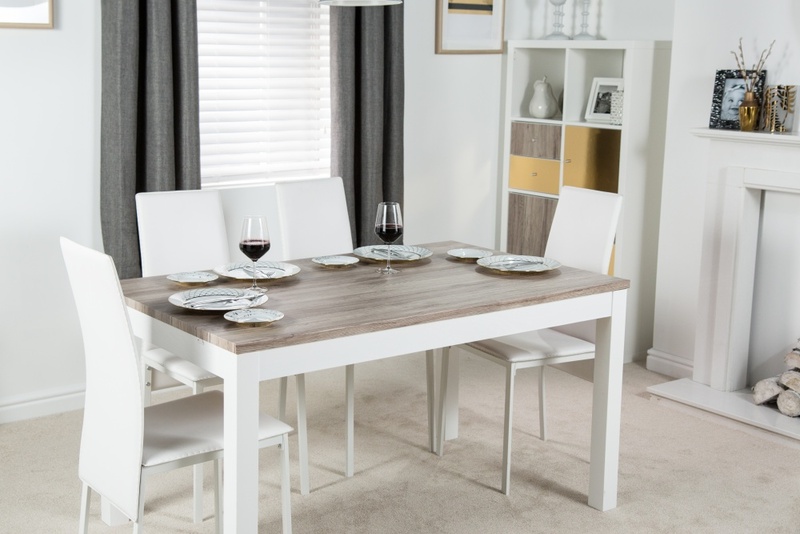 You can instantly breathe new life into your tabletop as well, tying it in effortlessly with your dining room style or new-found kitchen design. 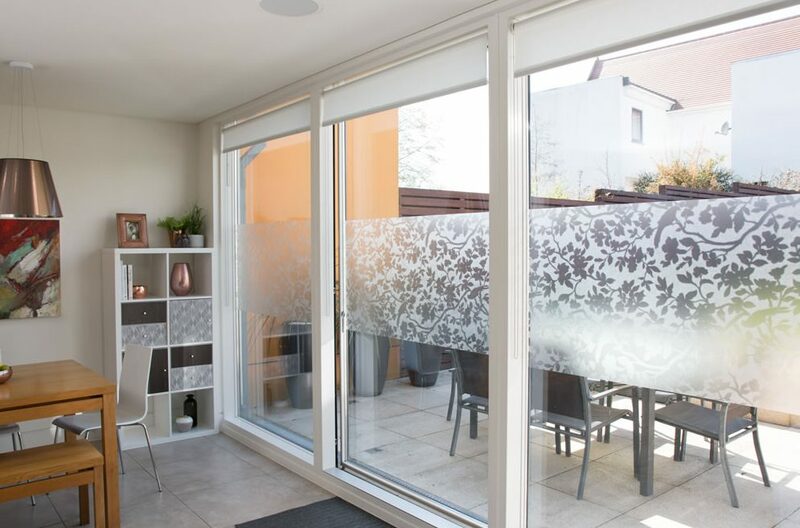 Decorating your windows with sticky back plastic not only adds a cool feature to the room but can also be used to create additional privacy. Once the kitchen’s finished, you can move around the home, revamping all those bits of furniture you’ve been wanting to replace for months, perhaps even years! 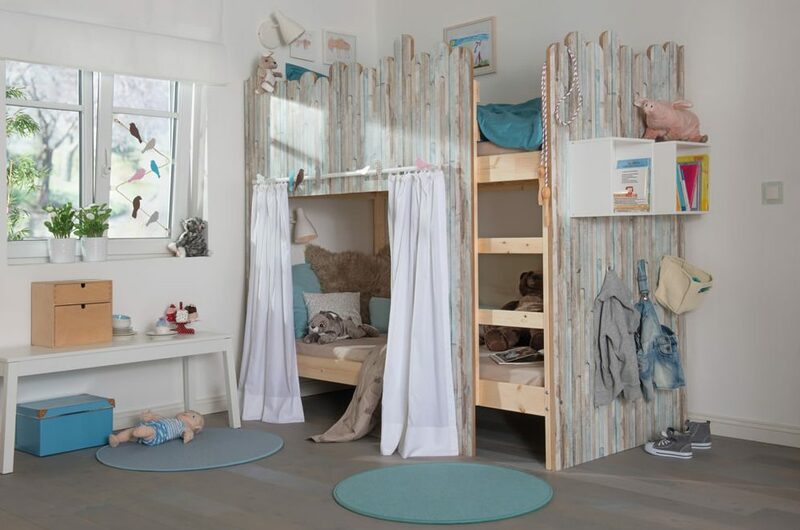 From wardrobes to drawers and even bunk beds for the kids, the possibilities are endless. It’s amazing what you can do with a few rolls of sticky back plastic and the d-c-fix application kit, isn’t it? Shop the full d-c-fix range online – and don’t forget to share your DIY kitchen projects with us on Twitter, Facebook and Instagram!